My name is Caro Pepe, and I’m a street artist. I was born in Argentina, but I live in Berlin. Right now, I’m visiting Stockholm to do a solo exhibition at Scarlett Gallery. The gallerist, Anthony Hill, invited me here, both for the exhibition and to create a piece for Subtopia. I’m very pleased with how the piece turned out, it came together really well. How did you come up with your motif, your character? I think the idea came to me when I moved back to Argentina from Spain. I decided to return to Buenos Aires. One month after I arrived there, I was having a sleepless night. I got some paper and pens out and began sketching. That drawing laid the groundwork for the character I still use to this day. A big head, a tiny body, and huge eyes. That was the first time. It might have had something to do with the whole “moving back home” thing. Who is the person in your drawings? She’s my alter ego, a personification of how I feel about different stuff. She says things I can’t say, or am too afraid to say–she’s my way of communicating fully. She has the courage to do what I won’t. But still, I think she’s more fragile than I am in a way. Whenever I hear a story, or witness something, she’s there to voice my opinion on the matter. To be my alternate personality. Photo Kristina Lindqvist. The work can be seen in the Subtopias outdoor gallery. Why does she only have one eye? The thing about the eye is that one day, I realised that I, well, all of us really, hardly ever have the ability to take in several points of view at a time. We’re all selective, we make choices. It’s through this limited perspective that we construct our entire reality. When I realised this, I thought to myself: I’m going to take an eye away. At least until I feel I’m truly able to take the whole picture in. But I doubt that day will ever come. Where else can your works be found? Lots of places! I’ve travelled around Europe a lot: Switzerland, Italy, Germany, and now Sweden! France, England, Poland, Tokyo, Latin America, Paraguay, lots of cities in Argentina, the USA, New York. In New York, it’s in Brooklyn, on Myrtle avenue, but I can’t remember the address–it’s somewhere in Bushwick. How did you get started as a street artist? It happened by chance. The first time I visited Berlin, I went there as a tourist. I didn’t like the idea of being a tourist, so I thought I would take a class–maybe an art class? 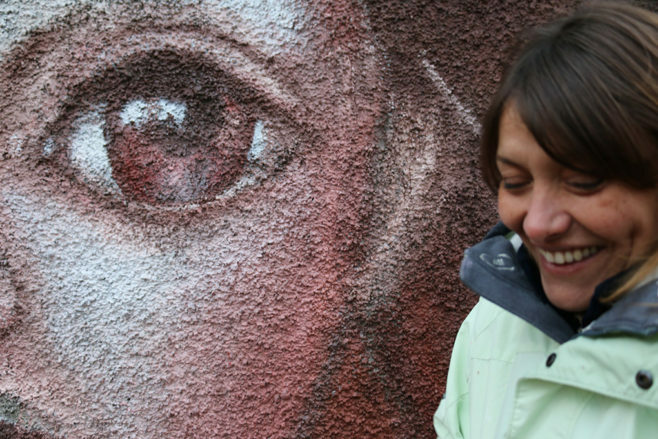 I had painted in a studio before, but all the people I met in Berlin were street artists. They encouraged me right away, and said “come paint with us! Look, here’s a wall for you to paint on!” At the time, there was a famous building there, Kunsthaus Tacheles. So I painted on it. Without having any real idea of what I was doing. I thought it would be easy, but it took me a whole week, even though the picture wasn’t even that big. After that, some people approached me and asked if I wanted to join them and go painting somewhere else. “Sure,” I told them. And then, it hit me: I wanted to keep doing this! I loved claiming all that space and getting to express myself in such a big way! There was simply no way for me to return to the studio. This was about five years ago. What tools do you use when you paint? I mostly use rollers and large brushes. Outdoor paints, which I touch up with spray paint in the final stages, to enhance the highlights and shading. Do you sometimes collaborate with others? Yes, often! Especially with the artists in Berlin, where I live. It’s our Saturday pastime: we meet to experiment and practice together. These days, I’ve been working quite a lot with somebody called HH. HH also happens to be my life partner, and so we do a lot of things together. But I work with many others, too. What would be your ideal location to put one of your paintings? Hmmm… I’ve actually never thought of that. Any time I see a nice, big wall. Nah, I don’t have an ideal location. If I find a place I want to use, I make sure to get to paint there. I get permission, talk to people. But sure, it’s true that some locations are better for your career and stuff, and give you better exposure. But nah, I don’t know. Tell us something about your new piece! 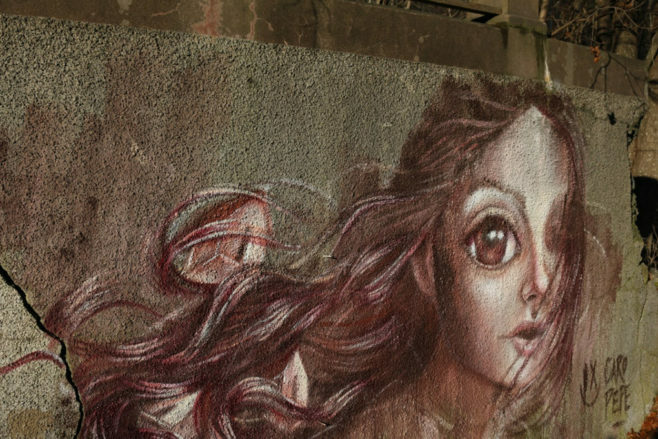 What is it like to be a street artist? The thing is, I really enjoy this lifestyle. But then again, it’s all I know. Travelling, meeting people, the social aspects of it, as well as the artistic ones. If you ask me, it’s the best of both worlds! I really love this, and I can’t imagine doing anything else. It’s a life of freedom. How did you feel when you painted this? It was a very beautiful day in November. When I’m painting, that’s all I think of. It’s a bit like meditating. Sometimes, it can even be painful to have to break with that feeling and return to reality! Read more about Subtopia's galleries here.